This queen sized low air loss mattress is identical to the low air loss mattresses used in the hospital. This Queen Size True Low Air Mattress accommodates more than one patient and fits on a queen sized box spring or medical bed frame. 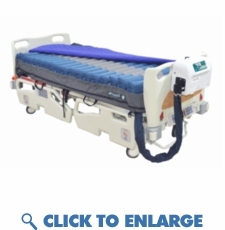 This queen sized low air loss mattress provides all the benefits of our true low air loss mattress plus a higher weight capacity, 54 or 60" Width , and a digital screen for entering the patients weight. This Low Air Mattress is now available in a Queen size width is packed with all of the features available on the market today. This Queen True Low Air Loss System is identical to our standard sizes used in hospitals. The Pro99-60 True Low Air Loss system offers an alternating pressure therapy, pulsation feature and continuous low air loss. This low air loss system is not only extremely comfortable but heals up to and including stage 4 bedsores and pressure ulcers. This queen low air mattress has 3 distinct therapy modes. The unique pulsation mode reduces the air flow every 30 seconds to 50% of the comfort setting. The pulsation cycles can be adjusted from 1minute - 20 minute cycles. This feature adds enhanced comfort and healing benefits and will intermittently reduce pressure and increase blood flow. The alternating pressure therapy can be adjusted by cycle times for pain management and patient comfort. The caretaker or patient has the ability to change the cycle time from 5 mins, 10 mins, 15, or 20 , 30 minute cycle times. True low air loss therapy manages moisture , shear and friction for sensitive skin, and the redistribution of pressure for optimal healing and long term care. Additional features include auto firm, rapid deflation, system lock modes, bariatric mode, and patient alarms. � The air cells are connected to the manifold using quick connectors and fastened to the base. The top sheet is strapped to the base. � Complete support surface is made of superior quality materials and is modular in construction. All of the components such as manifold, tubing assembly, air cushions, top sheet, and foam base are interchangeable, and can be easily cleaned or detached for laundry. � Weight capacity: 1,000 lbs. � 18 Month Warranty.